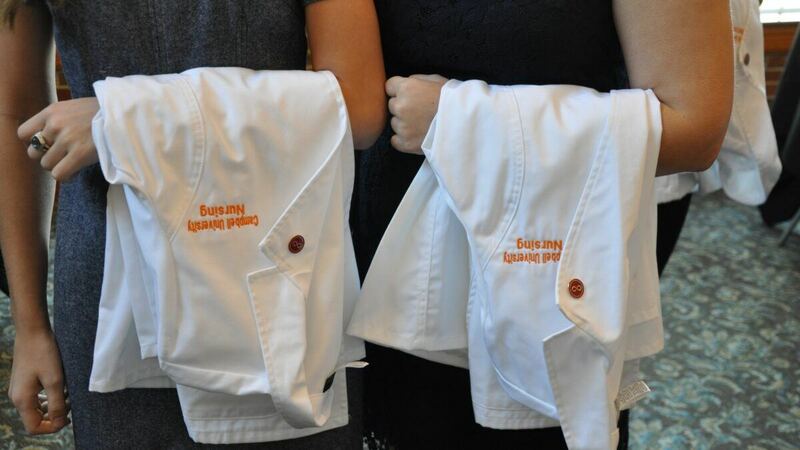 The Catherine W. Wood School of Nursing celebrated its 47 first-year students’ journeys to a bachelor’s degree with a white coat ceremony on Jan. 25 in Scott Concert Hall. Nancy Duffy, director of the Catherine W. Wood School of Nursing, opened the event by sharing the history of the White Coat Ceremony and its importance as a rite of passage to emphasize compassionate patient care from the very beginning of a nurse’s clinical education. The ceremony was made possible with a grant from the Arnold P. Gold Foundation to support the Gold-AACN White Coat Ceremony for Nursing, and each student was given the gift of a Keeping Healthcare Human lapel pin from the Arnold P. Gold Foundation. The keynote speaker, Erwin-native Tamara Dunn, serves as the Chief Innovation and Operations Officer and Chief of Nursing Officer for CommWell Health. Dunn shared her personal journey to becoming a nurse and the importance of treating each patient like family. She gave a real-world perspective on nursing and how nurses should keep in mind the “human” side of nursing by realizing that each person has personal factors that play into their healthcare. Dunn also encouraged the students to remember that there are many opportunities in the profession outside of the typical nursing jobs, and to be open to the exciting possibilities in their future. Each student’s name was called by Pamela Jenkins, a member of the nursing program’s Community Advisory Board, as students crossed the stage and were coated by a member of the nursing school faculty. At the end of the ceremony, Sharon Eck Birmingham, associate professor of nursing, led the students in reciting the Nightingale Pledge, an adaptation of the Hippocratic Oath.